History: 50 year old female with a hot nodule on a prior Tc-99m Sestamibi scan and hypercalcemia. 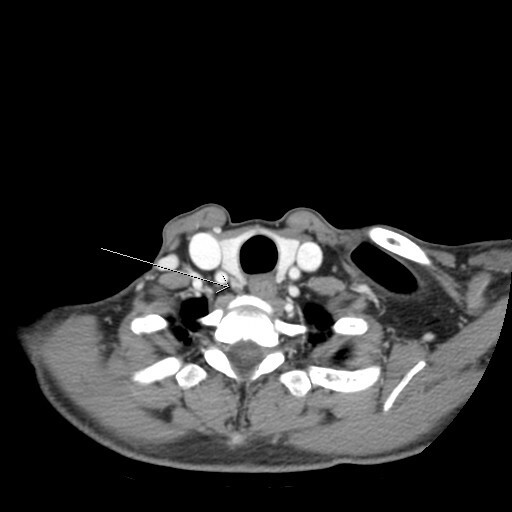 Parathyroid adenoma: Single axial contrast enhanced CT through the neck at the level of the thyroid gland reveals an enhancing nodule posterior to the inferior right thyroid lobe, compatible with a parathyroid adenoma. Given the history of hypercalcemia and hot nodule on the prior Tc-99m Sestamibi scan, this is compatible with a parathyroid adenoma, which was confirmed at surgery. Hyperparathyroidism was the etiology of the patient’s hypercalcemia.